A hi-hat is a great tool to have on set. It keeps you fast and helps you cram into spots that a normal tripod wouldn’t fit. Those who are used to using a hi-hat are also used to limited features and a rather large price tag. Why can’t someone make a hi-hat that functions like a traditional tripod? Well someone was listening when the Induro series was released. There are many features that carry over from larger pro tripods to the small Induros that will make you reach for it more often than with most other hi-hats. First and most important is the level of adjustability. There are numerous positions that you can lock in the legs to go from under 4″ to over 11″. For uneven terrain, the Induro has individually adjustable legs along with pivoting feet to level out on any surface. The hi-hat comes with its own half ball mount, again something that is not included with most other hi-hats on the market. Use this to attach to an existing flat mount tripod head or any other piece of gear. Around the bowl there are three separate mounting points for accessories such as articulating arms. The last feature that I love is the price. Both the 100mm and 75mm flavors come in at well under $300. This makes it easy to pick up one or more for around set. 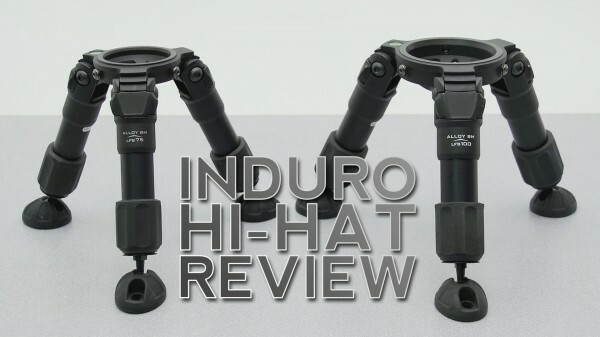 We love our Induro hi-hats and use them on almost every production we go on. Watch our video review below and pick up one today here. Canon EF 24-105mm f/4L IS USM …Mug?